« Askur And The Cows. Are they sour plum? I love the sour plum jam! We’re about to try making damson gin. Our first pear cake of the season, made using a neighbour’s windfalls, has been very good. Our cherry jam is pretty good as cherry jams go – but really nothing can compete with raspberry jam, can it? This cyder-press Herbsting must be catching. Though your fruit looks so much more… would “real” be the word? They are sourish when you cook them. 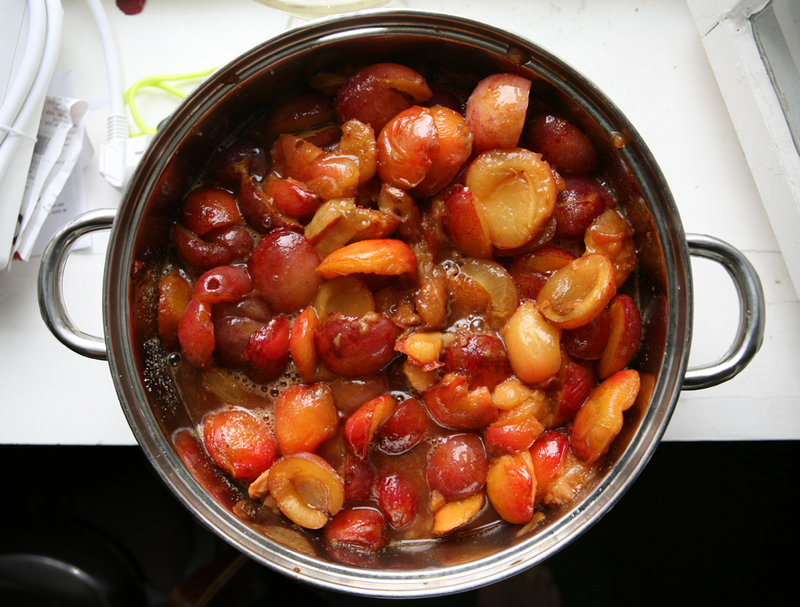 I was looking up plums yesterday, and it turns out to be quite an arcane subject: you’ve got your Japanese plums and your European, and no doubt your American. These are European. I want to plant another plum tree, I’ve got space for one more, and I read that the Old Green Gage – aka Grosse Reine Claude, in France (?) – is pretty good, but I don’t see much chance of finding one here. Tom, That’s a lovely post you’ve made. I’m putting the Keats here too, so I don’t forget it. I hope you don’t mind. I’m sorry I can’t do the indented lines, it won’t work. How kind of you to put it up on its birthday! Like Julia, you probably aren’t experiencing much autumn weather yourself. You ought still to be displaying Blake’s Ode To Summer. …And in case you’re wondering why I wrote German Herbst instead of Norwegian Høst for a title, it was just a mistake. I knew there was something wrong there. Oh well, I’ve fixed it now. We chopped down our greengage for reasons that must have seemed good at the time. Our damson flourishes in a hedge, and perhaps dates to the building of the houses here – 1920s. Twenty-seven summers ago it produced fruit in such abundance as to seem noisome at times; one could not take two steps without wading in the slushy windfall. But it gave us twenty-seven summers’ worth of pies, a fact that’s now appreciated entirely in retrospect, as this virtually summerless year of unusually cold weather seems to have deprived it of the ability to bear fruit. Beneath its ancient gnarled limbs lie the buried remains of a number of beloved furred “customers of the emporium”. So it stands as their memorial. Meanwhile, on a less melancholy note, the taste buds are kept alive by repeated glances at your mouth-watering photos, Artur. Your characteristically self-deprecating comment on the Russell Lee fruits-of-Pie Town post notwithstanding. I don’t think Keats would object to the lack of indents, by the by. His poem anyway is all about concessions. And the delight of your photos would have seemed more than a fair trade-off. He was a great lover of sweets — Yeats once rather snootily if not completely unfairly likened him to a small boy with his nose pressed against the glass of a sweet-shop window. If you click for enlargement, you will find, at bottom-center, in one of my “Deep Keats Scrolls,” his remarkable paean to a beatified strawberry. Really? It must be the global warming. Tom, thank you for that. I see he wrote about the nectarine on the twenty-second of September, three days after the Ode. Autumn was a busy time of year for Keats. “dates”: how cloth-eared of me. But I don’t give a fig. 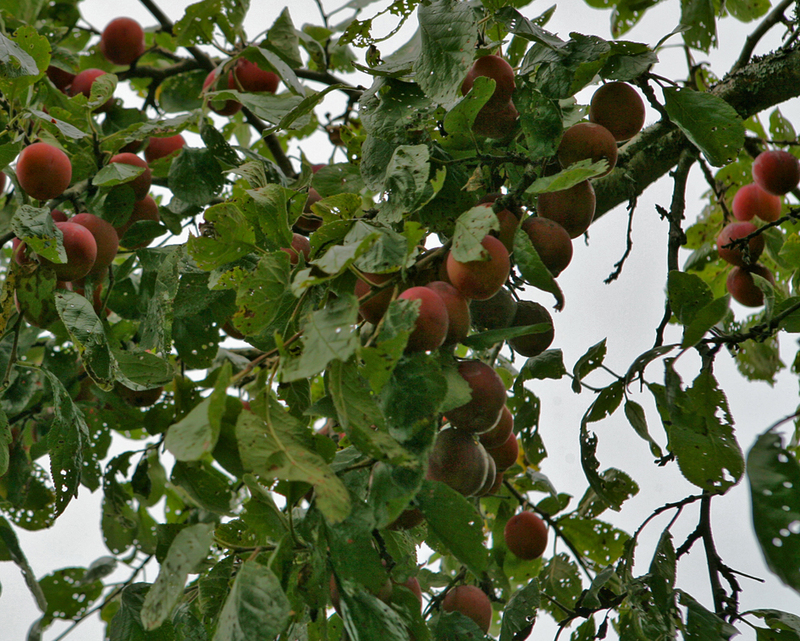 And what is a slab of mellow fruitfulness? It’s not at all the same as fruitiness. It’s autumn here all right. We’ve just had our first haggis. The Ardbeg is finished so we had some Glenfiddich. Not bad at all. There are few sights and smells I like better than a bubbling pot of homemade jam. Philistine that I am, I had never heard of of negative capability until I saw Tom’s Deep Keats Scrolls post. Googling it, I discovered a small-world connection: Negative capability is a sort of distant cousin of mine, in the sense that in my very much younger days, and his, I once gave Roberto Unger some lessons in mathematics. That’s funny, I thought of you when I saw it – or I thought, “I wonder what Ø would say about this”. I must be smarter than I knew. I am sure that you are. For example, no doubt you have been speaking prose for years. But really I know nothing about negative capability. Until yesterday my entire knowledge of Roberto Unger stemmed from this isolated odd interlude in my life: When he was a new member the Harvard Law faculty he set himself the goal of learning a little bit about the sciences (since he had missed out on that as a student in Brazil, where you had to choose early between the technical/scientific and the classical/humanistic) and very properly decided to begin with calculus, hiring a one-on-one tutor for the summer. That was me. I was recommended by a colleague of his, whose son was a classmate of mine. I met with him a number of times and probably taught him next to nothing, since I did not assign homework and I had essentially no experience teaching. We worked standing up in his office. One thing that blows my mind is that he was then only about four years older than me. I was 22 and could have sworn that he was much older. Reading it too. No, it must have been something else that reminded me of you. It was something, somewhere, about zero, I think. I must admit I find the Keats negative capability easier to understand than the Unger. Thanks to Tom, I’m getting rather fond of Keats. You’re right, you can’t learn math without practising, so you should have assigned homework. He looks the sort who would have done it. Young Master Keats (Junkets to his friends, playing on his Cockney pronunciation of his own name) had a great fondness for what he called “the pleasure of not knowing”. The “negative capability” moment was a bit of harmless and entirely untheoretical riffing resulting from imbibing a few warm punches and enjoying a Christmas mummer’s play with friends. If only Roberto Unger had taught our great compromiser that even more important than the pleasure of not knowing how to tax the rich is the urgency of knowing how to roll up your sleeves, forget everything you were taught at Harvard and tax the rich until they bleed a bilious green. Better to go down fighting for something than to stand up and compromise your way out of your principles. But somewhere there’s another truism: you can’t teach cojones. Well, on the streets, maybe… but not at Harvard, I reckon. Tom, do you know of a good Keats biography or any other good Keats-related books for a non-poet? At school we knew the two rascals as Sheets and Kelly. dearieme, that does sound a jolly comedy team. Artur, I think the story of Keats’ s life is appealing and moving even if one is not afflicted by poetry-writing. And the Georgian social word is so fascinating of itself. There are a number of biographies, the better ones having certain distinctive strengths. The three impressive “modern” biographies were written quite close together, helping to prevent repetition. These would be Walter Jackson Bate, a Harvard professor of English who is good on the literary context; the English biographer Robert Gittings, whose wealth of pure detail is unsurpassed; and an American academic Aileen Ward, whose psychological sensitivity, especially in bringing out the decisive effect upon Keats of the early loss of his mother (following the prior demise of his ostler father), comes closest, for me, to making the character come real. The final years of Keats’s life are so famously heartbreaking, one is drawn to those pages, though the pathos gets pretty thick. That’s why I find very useful a brilliant and strange little book by Anthony Burgess, ABBA ABBA, which “imagines” Keats’s last days in Rome; Burgess endows the poet with a bravery and toughness which make his account unusual, and bracing, for all the background sense of the extreme suffering going on. Conversely I did not find much use in the two most recent forays, Andrew Motion’s plodding, job-of-work doorstop production; or the Jane Campion biopic Bright Star, which pretties the matter up somewhat, saws hard on the heartstrings and finally seems to want to be about not Keats but Fanny Brawne, and the artistic side of her nature (which feels a bit trumped-up and overblown). The Campion film is annoyingly laden with passages in which Keats, more or less out of the blue, filters whole poems into his dialogue, or replaces the dialogue altogether with lines from the poems and letters. It’s my guess Keats was a witty and engaging conversationalist who would never have dared bore his friends (who loved him dearly, among other reasons for his modesty) by spouting his poems to them in lieu of conversation. Sorry to go on… but in the end, I’d recommend Gittings for the “facts”, Ward for the “feeling”, and Burgess for the curiosity of the effort. A very interesting review, Tom. Thank you so much, once again. I’ll start by getting Keats’s own work. It’s hard for me not to buy Bate, Gittings, Ward & Burgess – that well-known firm of solicitors – all at once, but I’ll have to get them one-by-one. Not to “overload your cart” (!) but, thinking a bit further — it’s perhaps a wonderful way to get to know Keats, someone whom in fact I believe you would have enjoyed knowing, to start by reading his letters. They show his wit, his warmth of feeling, his gift at being a fine friend. I’ll start with those, then. Thanks. I found a Gittings-edited edition.